The national flag of the Republic of Cuba was adopted on May 20, 1902 as an official ensign representing the nations sovereignty following the country's independence from the United States. Also known as the "Lone Star", the design of the national flag of Cuba has been borrowed from the flag of the United States. Designed by a Venezuelan general called Narciso Lopez in the year 1848, the flag of Cuba was used in the liberation movement that was launched to seek independence from Spain. Though the flag was hoisted for a short span in 1850, the official status as the national flag was granted only in 1902. 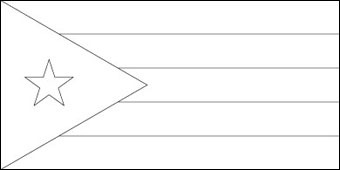 The flag of Cuba comprises five horizontal bands: the top, middle and bottom bands are blue; and the other two are white. The blue bands represent the three historic divisions of the island, while the white bands symbolize independence. The hoist side of the flag bears a red triangle that contains a white-pointed star. The triangle represents the virtues of equality, liberty, and fraternity and the color red stands for the blood shed by the patriots in the long struggle for independence.